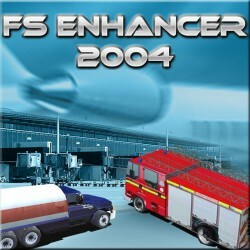 Description: FS Enhancer 2004 is the sequel to FS Scenery Enhancer for 2002 and includes FS Sound Scape and the best selling title for FS2000, FSTraffic, this all new product has now been totally redesigned to satisfy every simmer´s needs. This is the ultimate Scenery editing tool ever created for MS Flight Simulator! As long as you know how to slew in FS2004, you will be able to enhance your scenery to levels even professional scenery builders have not been able to do. Add a cow with one key combination, only see it in spring, summer and fall and when you get close you will HEAR it. There is no commercial scenery (except our GeoRender range) that has this. Want to hear wolves in the woods in the deep of winter and only at night? In 5 seconds you got it. Without ever leaving FS. Pros: Great and easy to use, heaps of objects etc..
Cons: Some items are missing and invisable!! (i.e Emergency Slide etc..lol), I WANT IT FIXED! Yup, its great, and i recommend, its so easy to use, BUT, some objects are missing!! Pros: Very helpfull for scenery maker like me. Cons: A little odd to use. This is a very good addon for people who like to make scenery but the way of placing the items is kinda odd and can be hard to place them stright. I re-created scenery for TNCM as if you remember the old freeware TCNM scenery on avsim was a bit odd. Its great for adding finishing touches and making entire airport or towns etc. Lovely product. There is also a community site where you can exchange and download new objects to use. Cons: Payware site not working? This look's like a great product, I'd love to be able to buy it. Sadly, neither of the two purchase links I've found seem to work. The Lago site (http://www.lagoonline.com/) stalls in an apparently infinite attempt to load some flash magic. The simMarket site has a page for the product (http://secure.simmarket.com/lago-fs-enhancer-2004.phtml), but the page offers no way to add this to the shopping cart. It appears that the product is no longer being sold. Too bad, because other downloads require it.